If your career is the open road, you want to take the route that leads you to the best truck driver jobs. To do that, it helps to have a complete and customized resume that demonstrates your experience. 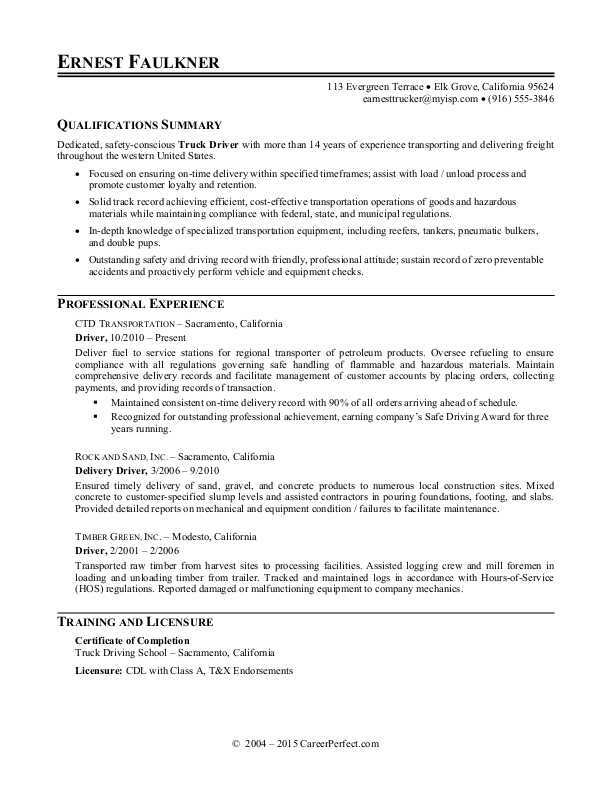 View our sample resume for a truck driver below to help get your own resume in gear, and download the sample resume for a truck driver in Word. Jobs for truck drivers are projected to grow by 6% (or 108,400 jobs) from 2016 through 2026, according to the Bureau of Labor Statistics (BLS). You'll find the highest level of employment for this job in the following states: Texas, California, Florida, Pennsylvania, and Ohio; and in the following metropolitan areas: Chicago, New York City, Houston, Dallas, and Los Angeles. As a truck driver, you can expect to earn a median wage of $42,480 per year, or $20.42 per hour, according to the BLS. Additionally, you can learn more about transportation careers on Monster. Dedicated, safety-conscious Truck Driver with more than 14 years of experience transporting and delivering freight throughout the western United States. Focused on ensuring on-time delivery within specified timeframes; assist with load / unload process and promote customer loyalty and retention. Solid track record achieving efficient, cost-effective transportation operations of goods and hazardous materials while maintaining compliance with federal, state, and municipal regulations. In-depth knowledge of specialized transportation equipment, including reefers, tankers, pneumatic bulkers, and double pups. Outstanding safety and driving record with friendly, professional attitude; sustain record of zero preventable accidents and proactively perform vehicle and equipment checks. Deliver fuel to service stations for regional transporter of petroleum products. Oversee refueling to ensure compliance with all regulations governing safe handling of flammable and hazardous materials. Maintain comprehensive delivery records and facilitate management of customer accounts by placing orders, collecting payments, and providing records of transaction. Maintained consistent on-time delivery record with 90% of all orders arriving ahead of schedule. Recognized for outstanding professional achievement, earning company’s Safe Driving Award for three years running. Ensured timely delivery of sand, gravel, and concrete products to numerous local construction sites. Mixed concrete to customer-specified slump levels and assisted contractors in pouring foundations, footing, and slabs. Provided detailed reports on mechanical and equipment condition / failures to facilitate maintenance. Transported raw timber from harvest sites to processing facilities. Assisted logging crew and mill foremen in loading and unloading timber from trailer. Tracked and maintained logs in accordance with Hours-of-Service (HOS) regulations. Reported damaged or malfunctioning equipment to company mechanics. Is your resume in the right gear? A flimsy resume will very quickly downshift your job search and could leave you stranded on the wayside. Want help making sure your resume shows just how driven you are? Get a free resume evaluation today from the experts at Monster's Resume Writing Service. You'll get detailed feedback in two business days, including a review of your resume's appearance and content, and a prediction of a recruiter's first impression. Let the experts at Monster help you get behind the wheel of a new job. Drivers / Daily Box Truck Route - Must have truck Start right away!